As Alexandria Ocasio-Cortez and other House Democrats promote a “Green New Deal,” one key element has been missing: green-oriented zoning reforms. 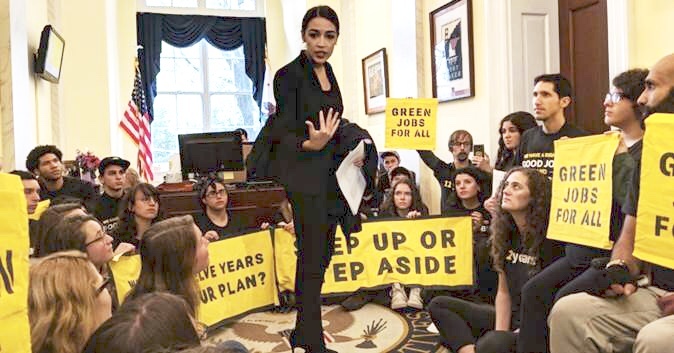 A truly Green New Deal must end exclusionary single-family home zoning laws that promote long car commutes, greenhouse gases and climate change by pricing out workers from living near their city jobs. The draft proposal for the Green New Deal urges a “’detailed national, industrial, economic mobilization plan’ allowing the United States to swiftly become carbon-neutral.” But you can’t get to carbon neutrality if cities maintain zoning laws promoting suburban sprawl over infill housing. In other words, Californians and other Americans must drive less. And that means ending the long daily car commutes that are now customary in far too much of urban America. Some Green New Deal proposals include affordable housing. But none recognize the essential link between promoting infill housing and reducing greenhouse gas emissions. By barring new affordable apartments in so many residential neighborhoods, exclusionary zoning undermines the Green New Deal’s goals. If it seems unlikely for Congress to wade into local zoning, consider that Senator Cory Booker recently proposed penalizing cities with exclusionary zoning by reducing their allocation of Community Development Block Grant funds (CDBG). But I am not optimistic about this approach. California spent years trying to reduce Redevelopment funding to cities that failed to meet their legally required 20% spending for affordable housing; these efforts failed. A measures that financial punishes cities for not making zoning changes likely has little political chance. Far easier for Congress to prohibit single family zoning in high traffic cities as part of a Green New Deal. I’ll be in Portland and Seattle this week talking with some of the nation’s leading green housing activists about the urban housing crisis (at Powell’s on Dec.4 and at Town Hall Seattle on Dec. 6) My new book, Generation Priced Out: Who Gets to Live in the New Urban America, highlights how activists in both cities are promoting infill housing. Green activists recognize that cities cannot meaningfully reduce greenhouse gases when their restrictive building laws require long car commutes to work. I often talk about the Prius-driving boomer in Berkeley who recycles household waste but who also opposes new apartments in their neighborhood; they do not see the 120,000 drivers commuting from Sacramento to the Bay Area each day, so do not appreciate the negative environmental impacts of their anti-apartment stance. The Seattle Sierra Club has been a leading advocate of allowing apartments in single-family zoned neighborhoods. The national Sierra Club could play a key role in ensuring that a Green New Deal addresses this issue. Given the political power of boomer-dominated homeowner groups that keep exclusionary zoning laws in place, some may question incorporating green zoning into the Green New Deal. Yet the climate change crisis requires more than mere incremental reforms. Naomi Klein wrote last week (“The Game-Changing Promise of a Green New Deal”) that the proposed House Select Committee for a Green New Deal have a mandate that “connects the dots between energy, transportation, housing and construction, as well as health care, living wages, a jobs guarantee, and the urgent imperative to battle racial and gender injustice.” That’s thinking big, and Klein’s inclusion of health care and living wages as part of the Green New Deal reflects this. That’s why advocates who are serious about “connecting the dots” cannot ignore anti-environmental single-family home zoning. If the Green New Deal cannot overcome the opposition of primarily white homeowners in progressive cities, what chance does it have in Congress against the far more powerful fossil fuel industry? Randy Shaw is Editor of Beyond Chron. He is the author of the just released Generation Priced Out: Who Gets to Live in the New Urban America.